The Penguins closed out the 2017 portion of the 2017-18 season last night in Detroit, the perfect city to close the shittiest first half we’ve seen since Michel Therrien was in charge. Now that the calendars have turned, we have finally closed out the below subpar month of December for the Penguins and look into the bright future of January, a month which brings snow, darker days, and high temperatures that rival the Penguins goals per game average. Shooting aimlessly into the air, perhaps the Penguins have more in common with Detroit than we realized? After the initial adrenaline of seeing Sprong on the bench wore off the Penguins remembered that they were playing in a hockey game in December so they fell back into their role of missing passes and looking completely lost. I wish I could tell you that Andy the Pens fought the good fight, and the Sisters Red Wings let them be. I wish I could tell you that, but prison is no fairy-tale world. He never said who did it…but we all knew. Things went on like that for a while. Prison life consists of routine, and then more routine. The Penguins first half of the season has been a lot like prison, except you actually get an hour of fun twice a week in prison. You also get raped by 3 inch diameter posts in prison, which is similar to the Penguins first half as well. The routine part the Penguins had locked down though, slip into oblivion and let other teams take advantage of you forgetting hockey was being played. The Red Wings did just that, and despite having 22 players you’ve never heard of and Trevor Daley, the Wings would strike first halfway through the period. The Penguins took that shot to heart apparently, as their collective hearts stopped beating. Fortunately for the team Matthew Murray was able to keep the bleeding to a minimum and the team escaped the first with only one blemish. There was a time not long ago that the Penguins were the deadliest second period team in the league. They were hungry. They would dissect their opponents first period tactics and shut them down in the second. They don’t do that no more. They don’t do much of nothin’ no more until the third. That being said, however, both teams would exchange goals in this period. The Wings would score first to go up 2-0 before Riley Sheahan would score against his former team to cut the lead in half. Nothing else doing this period. I wonder if the Penguins players were planning on celebrating New Years in Detroit or hopping on a plane really quick and getting back to the ‘Burgh? These were most likely their thoughts too, as evidenced by their complete lack of desire to be on the ice. It wasn’t all bad though, as some players did a few things right. They even scored a goal! 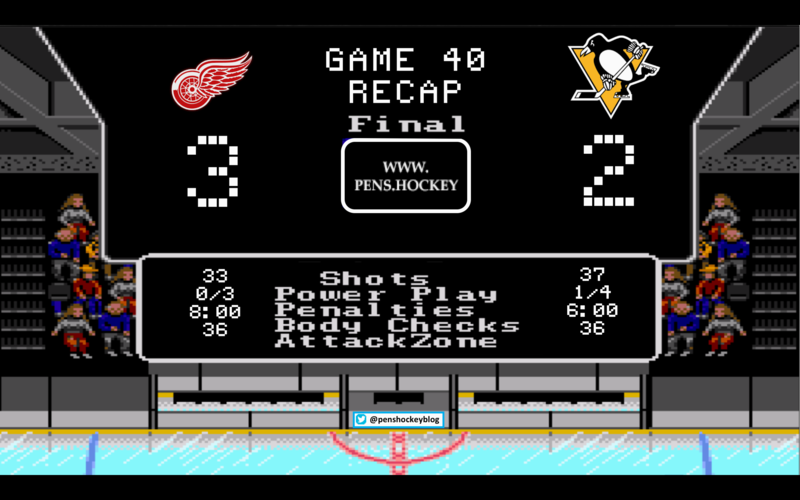 But with no Justin Schultz or Kris Letang the defense just couldn’t hold off Detroit forever and eventually the Wings would get one by Murray and Co to retake the lead. The Penguins picked up their effort as time ticked down, but they didn’t have enough to get the game evened up. The year ended with another L, man… it’s so cold in the D.
I had to go to a wedding that started at 7:00 pm EST on New Years Eve and lasted until 2 am. I didn’t know when or if I would get the chance to watch this game (or if I would even want to) so I typed up this recap at 3:30 pm on Sunday and decided that the Penguins season has been pretty cookie cutter so far, so how far off could this really be? I missed the final score, but overall I am pretty thrilled with my effort. Happy New Years everyone, may 2018 be great for all of you!